The Bruins look poised for a run at a repeat while the Sabres are spending to the cap for the first time. The Maple Leafs are hoping to build off a strong finish to the 2010-11 season and the Canadiens believe their depth is better now than it was last season. The Senators are in the early stages of their youth movement with the hope that having their top farm team win last season's AHL championship will benefit this season's NHL team. The champs have remained mostly intact, save for the departures of Recchi to retirement and Ryder and Kaberle to other teams through free agency. So, the core of the team will be back and ready to take a run at a repeat championship, and the additions of Pouliot and Corvo should help fill the voids left by Ryder and Kaberle. Pouliot is only 24 years old. He stumbled in Montreal last season, but Bruins GM Peter Chiarelli said he likes his size and skating ability and is hoping he fits in with the team mold that is already very much in place. 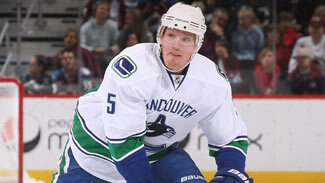 Corvo is a former Cup-winning, veteran defenseman who can move the puck and join the rush. 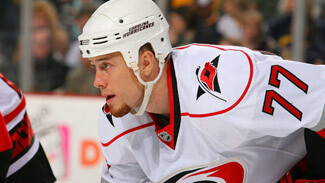 Caron, Sauve and, perhaps, another prospect or two will compete for bottom-six roles. There could be extra room if Marc Savard is unable to play -- nobody has been able to provide any clarity on his future. Bartkowski will likely be in competition with Steven Kampfer for the seventh spot on defense. The Flyers made the biggest moves, but the Rangers landed Brad Richards, the Penguins expect to have Sidney Crosby and Evgeni Malkin back, and the Devils and Islanders have young talent. The Habs added a big-ticket free agent in Cole, who scored 26 goals with the Hurricanes this past season, while also re-signing their best defenseman, Andrei Markov. to a three-year contract. Cole is a lock to play among Montreal's top-six forwards along with Tomas Plekanec, Brian Gionta and Michael Cammalleri. The No. 2 center position appears to be Scott Gomez's for now, but he could get pushed by Lars Eller once Eller returns from shoulder surgery in November. Andrei Kostitsyn is in the mix and Max Pacioretty will return from his near career-threatening injuries and also push for a top-six role. Markov is the most important addition to the Habs' blue line, as he missed all but seven games last season with a major knee injury that required surgery. Markov has had two major reconstructive knee surgeries and has played in only 52 regular-season games during the past two seasons; but, when healthy, he's one of the best in the League. Desharnais and Ryan White should take on bigger roles among the bottom-six forwards and Weber has a chance to play bigger minutes on the blue line with Hamrlik and Wisniewski gone. Also look out for Alexei Yemelin, a 25-year-old Russian who is playing on his entry-level deal. Markov will surely be mentoring Yemelin if he stays up in Montreal. The signings of Ehrhoff and Leino and the trade for Regehr have put the Sabres up against the salary cap, but in Buffalo, that's a good thing. Owner Terry Pegula has given GM Darcy Regier the ability to spend money to make the team better, and that's precisely what has happened, it appears. Ehrhoff and Regehr give the Sabres intimidating defensive depth, while their specialty teams should flourish as well. Ehrhoff is the new quarterback of Buffalo's power play and Regehr should lead the Sabres in shorthanded ice time. Coach Lindy Ruff believes Leino can turn into a No. 1 center after flourishing as a left wing alongside Danny Briere and Scott Hartnell in Philadelphia. Leino told Ruff he played center in Finland up until the age of 23, and, at 27, he's ready to take on those responsibilities again. The Sabres had an opening for a top-tier center with Connolly departing to Toronto via free agency. Provided Gragnani re-signs, the Sabres have 23 players under contract, including 13 forwards, eight defensemen and goalies Ryan Miller and Enroth. There may not be room for Kassian, Adam, Brennan or Schiestel unless someone has an amazing training camp. The Maple Leafs appear to be turning into the team Brian Burke wanted to build, but now they need Connolly to stay healthy and flourish as a No. 1 center because so much can happen if he does. Phil Kessel will instantly benefit if Connolly proves to be worth his two-year, $9.5 million contract. The Leafs should also be able to give the proper amount of ice time to Mikhail Grabovski, Tyler Bozak and perhaps Colborne while moving Kadri to the wing, where Burke believes he belongs. If Lombardi is healthy, he'll only add to the Leafs' center depth, which also includes Dupuis and Darryl Boyce, a pair of potential fourth-line pivots. Lombardi played in only two games last season before suffering a concussion. He was basically a throw-in to the trade that brought Franson to Toronto. Franson gives Toronto's defense more of that truculence Burke loves. He'll join captain Dion Phaneuf, Luke Schenn, Carl Gunnarsson and Aulie on a young blue line that will provide plenty of pop. The addition of Liles means the Leafs also have a puck mover to go with all that pugnacity. They also remain hopeful Mike Komisarek can still be a contributor. The youth movement is in full swing in Canada's capital city as Butler, Condra, Smith and Greening -- all members of the Binghamton Senators' Calder Cup championship team -- are all on one-way contracts and expected to start the season in Ottawa. Greening is 25, while Butler and Condra are 24 and Smith is just 23. All saw significant time in the NHL last season, so their feet are properly wet. Cowen and Rundblad are also looking to make the jump to the NHL. The Senators have some depth on defense, including a top-four of Sergei Gonchar, Filip Kuba, Chris Phillips and Erik Karlsson, but there is room to add a couple of rookies. Filatov will undoubtedly be watched closely in training camp as the former first-round pick in Columbus looks to re-make his image and prove to new Senators coach Paul MacLean he belongs in the NHL. 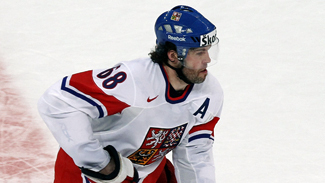 Filatov, the No. 6 pick in 2008 who was traded for a third-rounder this summer, is a top-six forward if he makes the Senators' opening-night roster. There is still part of the old core from the '07 team that made it to the Cup Final, including Daniel Alfredsson, Jason Spezza, Chris Neil and Phillips. Alfredsson is returning after back surgery, Spezza is also coming off an injury plagued season and Phillips is beginning on a new three-year contract. They'll have to help break in the youngsters who hope to get Ottawa back in the playoff picture.